I was dreading this task in a major way (and you can see why above). 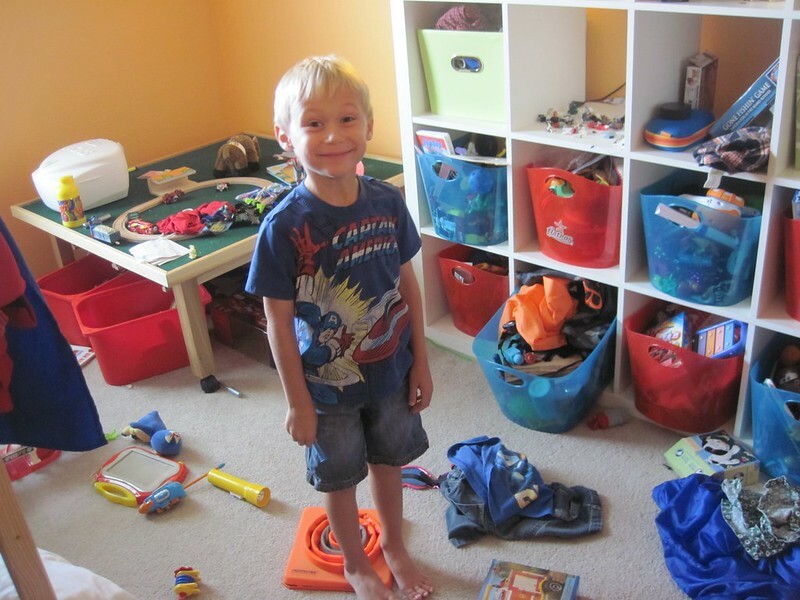 I used to clean out his room every six months – once at his birthday and once at Christmas, but then I got pregnant and probably didn’t do a big clean out for at least 18 months. We couldn’t find anything in his room, so it was time for a big re-organization. A room he will actually play in! He has spent a lot of time there this week and has been great about putting his toys away so far. It helps that the bins have adequate space in them for him to put things away. I swear hot wheels breed, I didn’t think we had that many but we have a ton. 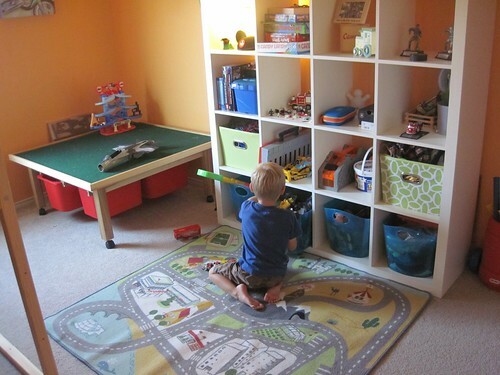 I also wanted his closet to be usable space, so I took everything out of it (oh my, the floor was covered with junk) and made it his “dressing room”. On the left, I’ve placed all of his school uniform pieces so he can choose his own clothes in the morning. There are also bins there that I’ll load with socks, his belt and other things that he’ll need for school mornings. 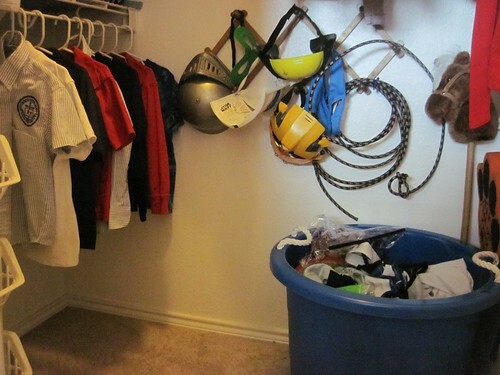 Then, on the back wall there is a bucket with all of his costumes and a hat rack for all of his masks and hats. It feels so nice to be getting a handle on things and making our space more usable, not to mention to be getting rid of so much junk we don’t need/use. Next up will be the baby’s room & closet (which houses my craft supplies). Semi-related, I’m also wanting to get into a cleaning routine for our heavy cleaning. Do you have any tips for that or any products that you find particularly helpful when cleaning? I’d love any suggestions you have! Tags: kid, organization. Bookmark the permalink. Ck out the website housewifehowtos.com it’s full of all different kinds of ideas! I use a lot of the method brand products. We use both the wood floor and the hard floor cleaners and I use the shower cleaner and toilet bowl cleaner. The wood floor cleaner smells like almond extract and doesn’t bother my allergies at all. I use a lot of vinegar and baking soda, for cleaning soap scum in the tub and grout cleaning and in the wash, especially my kitchen laundry! Oh, thanks for the heads up! I haven’t used method products before, but will check into them. Good smelling cleaners are so nice, especially with the kids being so near (or on) the floor much of the time.